Was there enough room in the extermination areas of the Operation Reinhard death camps to crush any bones that remained after cremation? There was not enough room in the extermination areas of Treblinka, Belzec, and Sobibor to crush the bones that were left after cremation. Holocaust deniers simply speculate about the lack of space for bone crushing at the death camps of Treblinka, Belzec, and Sobibor. The evidence shows that there was plenty of space for this gruesome task. Denierbud attempts to demonstrate that there was not enough room by diagramming three large black circular “ash piles,” each surrounded by a ring of eight blue, red, and yellow circles he calls bone crushing stations. He places all the circles on a football field to show how they would have taken up the entire field. Then, he searches for a similar, generously-sized area on the map of Treblinka and fails. Denierbud’s speculations raise more questions than they answer. How did he arrive at the dimensions for his imaginary circles? What are the dimensions? He simply slathers circles all over a football field. Why would the Nazis arrange everything in huge circles that used the most possible space? Why not just line up a few stations alongside the grills? He offers no proof for his figures or models. Denierbud uses a map of Treblinka from Yitzhak Arad’s study, Belzec, Sobibor, Treblinka: The Operation Reinhard Death Camps. On this map, Denierbud cannot find enough space for the bone crushing operations as he diagramed their dimensions. However, Arad’s map is not scaled and, therefore, cannot be used to accurately portray the size of the camp. Denierbud’s speculations about the amount of needed space is based on this map alone. Peter Laponder undertook to reconcile the various hand-drawn maps of survivors together with aerial photographs. His map is the first attempt at reproducing the camp to scale and it shows plenty of space in the death camp section, space not occupied by mass graves, piles of sand, buildings, or cremation grids. A recent and more pertinent study, The Reconstruction of Treblinka by Alex Bay, is based on his scientific analysis of photographs and utilizes the most current diagramming technologies. Bay found that the extermination area could have held nine pits sufficient for 900,000 remains. His diagrams leave more than enough space for the gas chamber, cremation grids, and areas for crushing burned remains. How long it would take to crush the final remnants of bone? Denierbud calculates that every station could crush one body every 3 minutes; 20 per hour; 200 per day if they worked 10 hours. Thus, one of his stations could have crushed a total of 1,600 remains per day. However, in his own experiment Denierbud leisurely crushed the remains of a 12.5 pound leg of lamb in about 10 seconds. Given the weight of the actual remains (25 kilograms or 55 pounds on average), the ashes of one body could have been crushed in less than a minute—not the 3 minutes he calculates. That translates into 600 remains per day if only one Jewish prisoner was assigned to the task. However, we know that historically the work groups in the extermination area of Treblinka numbered over one hundred men at any given time. Clearly, there were plenty of prisoners available to crush the remains efficiently. After a cremation grill cooled off, the ashes would be raked off to a side area for crushing and sieving. Large remnants of bone would be returned to another grill for more cremation. 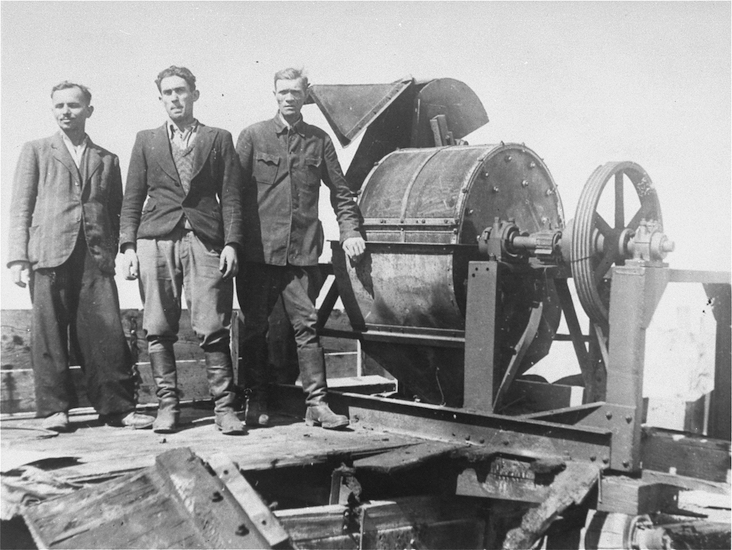 In some camps, such as Janowska, outside Lvov, Poland, a bone crushing machine may have been used. The ashes were then reburied in the empty graves. There is documentary evidence about how the ashes were handled in Treblinka. Kurt Franz was the last commandant of Treblinka. Although photographs were explicitly forbidden by SS directive, Franz took numerous pictures of the camp. He made a photo album of his days at Treblinka, which he perversely named “Wonderful Times.” Franz photographed his SS colleagues, his dog Barry, and the animals in the Treblinka “zoo.” The album was discovered by German authorities in his apartment when he was arrested in the early 1960’s. Franz took several photographs of the excavators in the mass graves area. Alex Bay carefully studied Franz’s photographs and found two photos that show five probable ash heaps surrounded by Jewish prisoners who are apparently crushing and sieving the ashes. Another photograph shows a horse and cart near a series of ash piles, indicating that leftover parts might have been hauled some distance from the cremation sites for crushing and sieving. These photographs also show the general size of the death camp area, which was more extensive than Holocaust deniers maintain. “One Third of the Holocaust” at http://www.youtube.com/watch?v=taIaG8b2u8I at approximately 3:10 to 3:16 minutes. Chil Rajchman, The Last Jew of Treblinka: A Survivors Memory 1942-1943 (Pegasus Books, 2011), p. 77. Robert Muehlenkamp, “Incinerating corpses on a grid is a rather inefficient method . . . “ at http://holocaustcontroversies.blogspot.com/2006/12/incinerating-corpses-on-grid-is-rather_18.html citing the interrogation of Pavel Leleko on February 21, 1945 at http://www.nizkor.org/hweb/people/l/leleko-pavel-v/leleko-002.html. “One Third of the Holocaust” at approximately 3:13 to 3:14 minutes. Alex Bay, “The Reconstruction of Treblinka (“The Death Camp”) at https://archive.org/details/TheReconstructionOfTreblinka. See Figure 42, Projection of Mass Graves. “One Third of the Holocaust” at approximately 3:13 minutes. “One Third of the Holocaust” at approximately 3:11:20 to 3:11:30 minutes. See Yad Vashem archives at http://collections.yadvashem.org/photosarchive/en-us/39734.html. Alex Bay, “The Reconstruction of Treblinka” at https://archive.org/details/TheReconstructionOfTreblinka. See Figures D2 and D3. Franz Suchomel’s testimony in Claude Lanzmann’s Shoah. The film transcript is available in Claude Lanzmann, Shoah: The Complete Text of the Acclaimed Holocaust Film (Da Capo Press, 1995), pp. 52, 53.